Nissan may build Leaf electric vehicles in the southern Chinese province of Guangdong, according to a government statement. Nissan's Chinese joint venture with Dongfeng Motor Group Co. may invest 2 billion yuan ($322 million) in the project, the National Development and Reform Commission's Guangdong branch said on its website. According to the statement, the plan calls for initial capacity of 10,000 Leaf units a year and 50,000 after 2015, comparable to Nissan's U.K. and Japan plants. 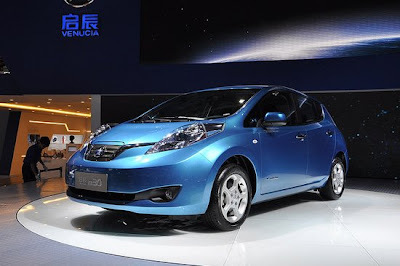 Dongfeng Nissan Passenger Vehicle Co., a Chinese joint venture of the Japanese automaker, showed off it's first electric vehicle under its China-only Venucia brand, the e30, at the Guangzhou auto show in November 2012. Leaf production in Guangdong is among major new-energy vehicle projects listed in a 2013-2020 plan released by the provincial government. The province, bordering Hong Kong, is also home to BYD Co., maker of the e6 electric car. The Guangdong province aims to build its annual production capacity for alternative-energy vehicles to more than 200,000 units a year by 2015 and boost sales to 50,000 units by then, according to the statement. Total sales of such vehicles in the province were about 7,000 units in 2011, the local government said.